When It Goes From Bad To Worse – Nacho Mama Food Truck – Kent, Ohio – Food Truck Talk – Searching for the best foodtrucks! Greetings, gentle readers. The more astute among you may have noticed that the amount of time since my last post has been right around a year. I’ve posted in the past the reason for the long gaps and what was true then remains true now: I just don’t have the luxury of the time required to write this blog on a consistent basis. So what brings me (temporarily) out of retirement today? A troubling tale I am prepared to tell, involving a food truck, squishy Italian hoagie rolls, and a blatant disregard for the safety of customers. This isn’t the first time I’ve written about food trucks on this blog. Some of them, including The Orange Truk, Wholly Frijoles, Zydeco Bistro, and Boca Loca Burrito Factory have set out and accomplished the main goal of a food truck: to be unique and serve quality, freshly prepared food to the people for a reasonable price. The best food trucks seek to recreate the same food experience one would find at a great restaurant (at least in terms of the food). Of course, I suppose you can’t have the best without having the worst. While I want every restaurant (and food truck) to succeed, real world studies indicate that nearly 60% of restaurants will fail over a three year period. Today’s visit to the Nacho Mama Food Truck out of Kent, Ohio proved exactly why this is the case. Being a lovely sunny day in the low 70’s was too much of an allure to stay indoors. Coupled with the announcement I saw by one of the many food trucks I follow on Facebook, I discovered that there would be a “round up” of seven trucks at the Home Depot in Cuyahoga Falls. When I got to the round up around noon, I was relieved to find that the lines were fairly short. After getting my camera equipment set up in the back of my car, I walked around to survey the goods. While I enjoyed the crepe I had at Premier Crepes at a past round up, I wasn’t really in a crepe kind of mood today. Surveying my other options, I finally settled on Nacho Mama Food Truck. I had seen it at other round ups, but had yet to try their food. Today was as good as any to give it the college try. I approached the truck and began to read the menu. The first red flag was that the chorizo dog they were offering was misspelled as a “chirizo” dog. Thinking the misspelling might have been done on purpose as a marketing gimmick, I asked the woman taking orders if that was indeed the case. When she stared back at me blankly, my question was answered without her having to actually say anything. Other menu items for today were nachos (as the name of the truck would imply), burritos, and a few other things aimed at children. My philosophy when trying out a new restaurant (or truck) is generally to buy two or three items, photograph them all, eat one and take the other(s) home for later consumption. After ordering my chorizo dog topped with the spicy slaw, I set about attempting to order the tequila lime chicken nachos. This was where things started to get a little dicey. While people like to claim that they want choice in their lives, when faced with too much choice, the average human being becomes paralyzed with fear over having to actually make said choice. And with some fifteen toppings from which to choose, it took me a minute to get my bearings. 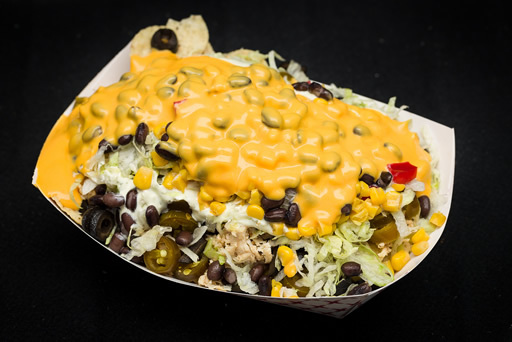 Nacho Mama might be better served by offering a “standard” – beans, lettuce, tomatoes, shredded cheese, and salsa – and then allow customers to modify it to suit their taste. For whatever reason I was feeling in a nacho cheese kind of mood, so I added it as one of the toppings. After paying the $15 for my haul (I included one of the Pepsi products as well), I walked to the other end of the truck to wait for my food. Within a minute or so, the woman inside the truck handed me the chorizo dog. While waiting for my nachos, she helpfully informed me that the chorizo link was actually from a place with which I am quite familiar, Dumas Meats in Mogadore, Ohio. That, to me, was a good sign. The bad sign, sadly, was the white squishy Italian hoagie bun on which the dog had been served. More on that later. The last step before handing me my finished nachos was the ladling on of the cheese. Sadly, this happened straight from a very large can that had no cover on it that was labeled, “Nacho Cheese.” One might find this type of product at any Gordon Food Service (GFS) / Sam’s Club / food wholesale place and would have probably been more correctly labeled “pasteurized cheese food product” rather than just “cheese.” Regardless, after the ladling of the cheese, she handed it to me. The first thing I noticed besides the dayglo orange color of the cheese was the heft of the basket in my hand. For $7, you certainly got your money’s worth, I thought. As I crossed the parking lot to my waiting car, I began to notice a problem. The nacho cheese had been poured too closely to one of the edges of the cardboard container and as it settled, had started to ooze over the edge. Not wanting to set this down anywhere in or on my car, I did the only thing a person holding a soda pop and chorizo dog in one hand and a container of nachos in the other hand could do: I decided to lick the cheese off the cardboard. I figured I just wouldn’t photograph that side of the dish. I put the cardboard container to my mouth and gently licked the offending cheese off with a quick swipe of my tongue and gasped in amazement: the nacho cheese was ROOM temperature! Now, those of you reading with no commercial food preparation or restaurant experience may think my negative reaction was due to the fact that I (and probably you) prefer your nacho cheese food product served hot. Tepid liquid cheese is just not something I relish the thought of eating. In reality, my surprise was due to the fact that by not holding the cheese at a proper serving temperature, the Nacho Mama Food Truck folks were playing Russian roulette with their customer’s health. So, let me see if I’ve got my math straight. The food trucks started serving food at 11 am and I was there at noon. Best case scenario, let’s assume that the staff opened a fresh can of nacho cheese sauce right at 11 am. So, an uncovered can has already sat there for an hour right in the middle of the temperature danger zone? You can see why I was so alarmed. And honestly, if they can’t hold this food at the proper temperature, what makes me think they know how to hold any other food at the proper temperature to avoid potentially getting people sick. 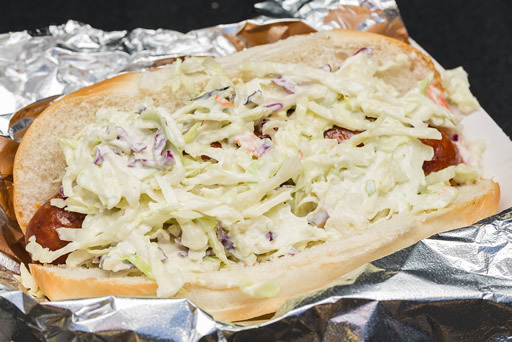 The large Italian-style hoagie bun was straight out of squishy white bread hell and couldn’t contain the dog and the slaw. Within another couple of bites, the dog had broken through the spine and by the time I got halfway done with it, the bun had completely split along the spine, offering no additional structural support to keep everything together. Fortunately, I had the presence of mind to grab a plastic fork from the truck and while I had originally envisioned using it with the nachos, found a more appropriate use for it to clean up the mounds of slaw that had fallen into the waiting basket below. The only real positive for me about this dog was the chorizo link itself from Dumas Meats. I ended up disposing of the nachos in the garbage can, not even wanting to eat a single bite. I packed my camera gear away, got back in my car, and drove off. I do not plan on eating at the Nacho Mama Food Truck again, really for two reasons. First, the food safety issue (and that is the elephant in the room). Second, the quality and uniqueness of the food just didn’t appeal to my sense of adventure. It felt like really bad Americanized versions of Mexican staples and honestly, there are plenty of other places I can already go to for that. You can definitely cross this food truck off of my list of places I’d recommend.